By any measure, it has been another extraordinary week in the presidency of Donald Trump. The president came up short in hopes of striking a major nuclear deal in his summit with North Korean leader Kim Jong Un. Trump’s efforts in Vietnam were largely overshadowed, though, by the riveting testimony before Congress of his once trusted personal lawyer, Michael Cohen. It was another glaring example of the split-screen nature of the Trump presidency. There was disappointment in Hanoi after the Trump-Kim summit failed to live up to expectations for a comprehensive agreement on North Korea’s nuclear program. 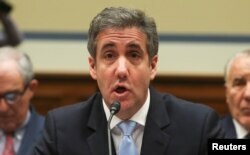 Michael Cohen, the former personal attorney of U.S. President Donald Trump, reads his opening statement as he testifies at a House Committee on Oversight and Reform hearing on Capitol Hill in Washington, Feb. 27, 2019. But the events in Hanoi were largely eclipsed by another drama half a world away that played out in a congressional hearing room Wednesday in Washington. Cohen, the former longtime personal attorney and fixer for Donald Trump, submitted to hours of public testimony that hinted at possibly ominous consequences for the president. Cohen unloaded on his former boss, describing incidents where Trump either allegedly lied or may have broken the law. These included allegedly being directed to lie about the president’s knowledge of hush money payments to adult-film star Stormy Daniels. She has said that Trump bought her silence to cover up an affair, which the president has denied. But beyond the specific allegations made by Cohen, he also painted a broader portrait of the man he worked for as a key associate for many years. Trump has denied Cohen’s allegations. At his post-summit news conference, the president said Cohen’s testimony was “incorrect” and he blasted Democrats for holding the hearing while he was negotiating with the North Koreans. “I think having a fake hearing like that and having it in the middle of this very important summit is really a terrible thing,” the president said. During the hearing, Republicans did little to challenge Cohen on his specific allegations regarding the president. They did slam him as an admitted liar and unreliable witness, however, who was being used by Democrats to go after the president. “This is an attempt to injure our president and lay some sort of soft cornerstone for future impeachment proceedings,” said Republican Congressman Clay Higgins of Louisiana. On Thursday, Republican Jim Jordan of Ohio underscored this view, slamming the Democrats. “I do think they are going to pursue this crazy course toward impeachment,” he said in a brief interview with VOA congressional correspondent Katherine Gypson. He went on to describe Trump’s tenure in office so far as “an amazing two years,” citing tax cuts, economic growth and the lowest unemployment rate in 50 years. During hours of testimony, Cohen documented his journey with Trump from ardent defender to disenchanted adversary. But Cohen also apologized for previously lying to Congress, and he lamented that he was loyal to Trump for so long. A sign reading "Liar Liar Pants on Fire!" is seen behind Rep. Mark Meadows (R-NC) and other Republican members of the committee during the testimony of former Trump personal attorney Michael Cohen at a House Committee on Oversight and Reform hearing on Capitol Hill, Feb. 27, 2019. 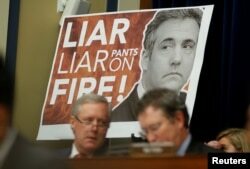 Despite Republican efforts to pummel Cohen as an untrustworthy witness, the political and legal damage wrought by his testimony could turn out to be substantial. “Michael Cohen is not a good witness, not a great witness. He is the ultimate witness because he was there. He lived it. He breathed it,” said former prosecutor Randy Zelin in an interview with Associated Press Television. Beset by weak polls and investigations at home, Trump was hoping for more success with North Korea to boost him domestically. As other presidents before him, Trump is looking abroad for a foreign policy success that he could tout in time for his re-election campaign. “For Donald Trump, he loves the pomp, he loves the circumstance, and he is not the first, nor will he be the last president, who turns across the ocean when their approval ratings are low, and his are low,” said California political analyst Sherry Betich Jeffe via Skype. The lack of a breakthrough on North Korea combined with the public spectacle of Cohen’s riveting testimony come at a time when the president is preparing to face a daunting political landscape for next year’s campaign. “Look, he is still at 43 or 44 percent of public thinking he is doing a good job. That is not a terrible number, but it is probably not a high enough number that he would want to go into the election [with]” said John Fortier of the Bipartisan Policy Center in Washington. The Cohen testimony also serves as a reminder of the challenges for President Trump in the weeks and months to come. They include the long-anticipated report on the Russia investigation led by special counsel Robert Mueller, and a growing list of investigations from congressional committees headed by Democrats after they won back control of the House of Representatives in last year’s congressional midterm elections. VOA congressional correspondent Katherine Gypson contributed to this report.